For 6 years running, I have had the privilege of being one of the writers for Spokane Coeur d'Alene Living magazine's "Best Of" issue. This popular issue highlights top vote-getters from an annual reader's poll. Like the presidential election, if you didn't vote, you don't get to complain. And like the Oscars, sometimes who should win, doesn't. Regardless the color of the medal, all of these businesses are worth discovering and experiencing. The 121 categories are haphazardly divided between a small team of sassy writers. I do however usually get to do the WINE related ones. The title of my write-ups are in GOLD. Enjoy! Bravo, readers of Spokane Coeur d’Alene Living, you sure know how to handle the pressure when it is placed on you! In our June 2012 issue we presented you with a challenge: to find the best of the best, the cream of the crop, the grandest of the grand. We were looking for the Best of the City, and it required hard work and dedication to find what is the best of the best in nine different categories. We needed you to be up for the challenge, because this was more than just picking places that were good. Nope! We needed you to scour our city until you found places that went beyond impressive, beyond remarkable and slipped full on into the “oh my goodness the heavens parted and angles sang” category. You ate, you dined, you played, you interviewed, you embraced, you embarked and you partook. The work was hard, demanding and all encompassing, but you delivered. 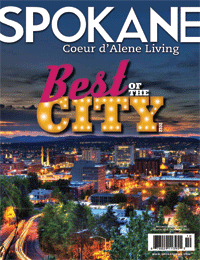 We now know, with absolute certainty, what makes Spokane one of the best cities in which to live. Let us explain it to you in 121 ways…. There is a good chance you gave Victor the gold for his hummus after you talked to him personally in a local supermarket. That’s where he hands out samples of his locally produced spread that features organic garbanzo beans. We love his Toasted Sesame version, but you also can head in the Nutella direction with his Chocolate H’Mousse™. The multiple Rocket locations again this year take Bakery gold for their classic pastries that have a spot in your heart (and possibly around your waist). We confess to eating more than our share of triple berry scones, pumpkin bread, pink sugar cookies and muffins with some serious bran. (KF). OH, WHAT TO DO, WHAT TO DO?! VROOM VROOM! GET YOUR MOTOR RUNNING!